The 28 lamp results from an innovative fabrication process that manipulates both the temperature and the direction of air flow into blown glass. 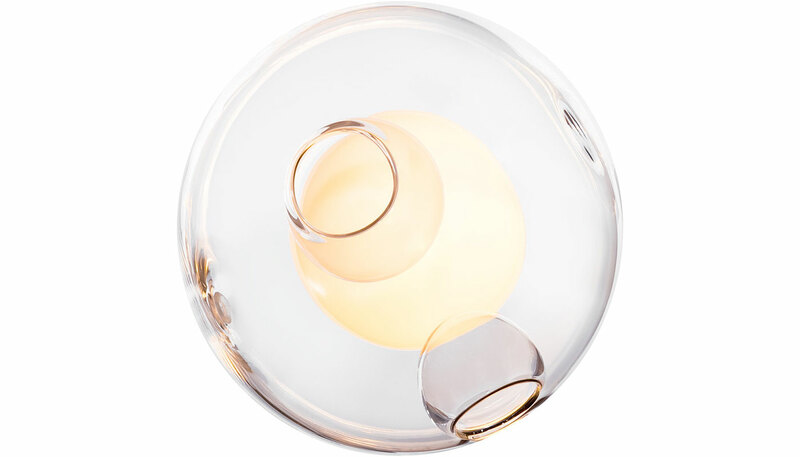 The result is a slightly distorted sphere with an interior landscape of satellite shapes, including an opaque milk glass diffuser that houses either a 20 watt Xenon (dimmable) or 1.8 watt LED lamp. LED version is dimmable when using a compatible dimmer supplied by others. The 28.1 lamp has a round canopy in brushed nickel and weighs approximately 2.4 lbs. One Xenon or LED bulb is included. Approved to UL Standards by CSA. Manufactured by Bocci. Standard drop length up to 10' max. Custom lengths available for additional charge up to 100'. Additional color options, compositions, sizes and shapes are available. Please note that Switch Modern contacts all purchasers to confirm the specific details of their Bocci order.